My piece will be included in this anthology. And yes, I’m VERY excited. Looking forward to the launch! The first time a piece of your writing was published? How your heart tap-danced on your ribs? How you wanted to stick your chest out proudly and at the same time hide under your bed? Remember how it felt the second time? Or the third? Doesn’t matter how many times I’ve been published I still feel that same ecstatic thrill. It’s building up now that MIRRORS is ready to be launched. Times it by 8 other writers and that’s a lot of very excited authors. 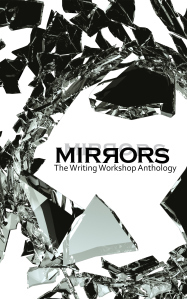 Within the next few weeks the Writing Workshop anthology will be available on Amazon and we couldn’t be more thrilled. You just can’t see how excited because we’re under the bed. Keep a watch for the final launch details here.